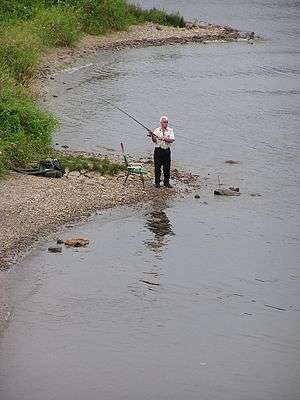 Bank fishing is fishing from places where the land meets the waters edge. Fishing from rocks is usually called rock fishing. Like rock fishing, bank fishing is typically done by casting fishing bait or lures into the water in an attempt to catch fish. Bank fishing is usually performed with a rod and reel but nets, traps, and spears, and fishing lines used without rods can also be used. People who fish from a boat can sometimes access more areas in prime locations with greater ease than bank fishermen. However many people don’t use boats find fishing from a bank has its own advantages. Many things contribute to success in bank fishing, such as local knowledge, water depth, bank structure, location, time of day, and the type of bait and lures. Fisherman have different preferences about the equipment they use for bank fishing, but most agree with certain basics. Obviously fishing tackle is needed. Most bank fishing is performed with a rod, reel and lures or bait. Often two fishing rods are used. The bait can be changed on one rod while fishing continues with the other. Some fishermen bring a lidded container for the fish they catch which doubles as a seat. Other fishermen bring a stringer to hold the fish they catch. Catch and release fishermen don't need either of these. With growing technology some luxury equipment has been developed such as the fish finder that uses sonar or a camera to physically locate fish. This is typically reserved for boat fishing but can also be applied to bank fishing. Some fishermen, and even professional anglers, find advantages in fishing from a bank. According to professional angler Joseph Raines, “I've bass fished from the bank most of my life, and have had tremendous success. I have caught all of my 7lb. plus bass from the bank. I recently caught a twelve pound bass right on the bank." Bank fishing requires the fisherman to scout and locate prime fishing locations. Some anglers view this as an advantage because it sharpens their skills by forcing them to pay close attention to important details that boating anglers may miss. Bank fishing can also allow a person to reach areas that a boat can’t, such as shallow or densely covered areas that might be tricky for a boat. Bank fishing can also avoid the costs involved in owning a boat. Compared to bank fishing, boat fishing provides access to prime areas with greater ease and speed. Also bank fishing doesn’t allow access to fishing areas that are too far away from the bank. Boat fishing allows fishing for deep water fish, such as lake trout, that may be impossible for bank fishermen to catch. A boat also allows fishing methods not available to bank fishermen such as trolling, deep water jigging, or down rigger fishing. There are many things to take into consideration during and before bank fishing and many of them depend on the type of fish you are fishing for. An important point to think about is the structure of the bank. Is it rocky, grassy, woody, or sandy. Different fish prefer different structure types. Also look at the surroundings on the bank. It may be an open area with no cover or it may be densely covered with trees. The surroundings could play a key role in providing shade (or not) which is important because it regulates water temperature and the viewpoint of the fish. Also look around at the surroundings for footprints, debris, broken branches and any other signs that other fishermen have been there. This may be a sign that the area has been over-fished which might reduce your chances of a good catch. One should even consider the minute things that might be easily overlooked. Pack lightly. When fishing from the bank you won’t want to carry a large load. Blend into your surroundings. Fish are able to see things through the water that may seem out of the ordinary and might spook them. Remember to be quiet near the water and minimize the amount of noise made with the bank which could also spook the fish. 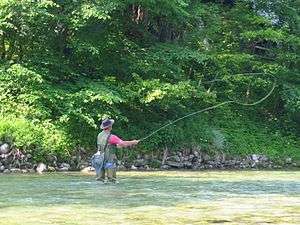 Finally, a general rule of thumb is to use no longer than a 6 foot pole when fishing near trees or brush to minimize getting hooked on branches. This article is issued from Wikipedia - version of the 7/5/2014. The text is available under the Creative Commons Attribution/Share Alike but additional terms may apply for the media files.